I've been pondering about the latest Picture This photo contest that Gardening Gone Wild is running. The challenge this month is to capture the beauty of grasses. My pondering is because at this point in time my ornamental grasses are only just now putting some seedheads on. A month from now they'll look great. But not so much now. So I guess I could go back and look at some photos from last year or so. Which is what I did. But lo and behold I became captivated not by my ornamental grasses, but by some beautiful (to me) grasses out in the wild. So I'm not sure if I can even enter the picture above since it's not in my garden. If it's not "legal", that's okay. I'd like to show you some grasses anyway. 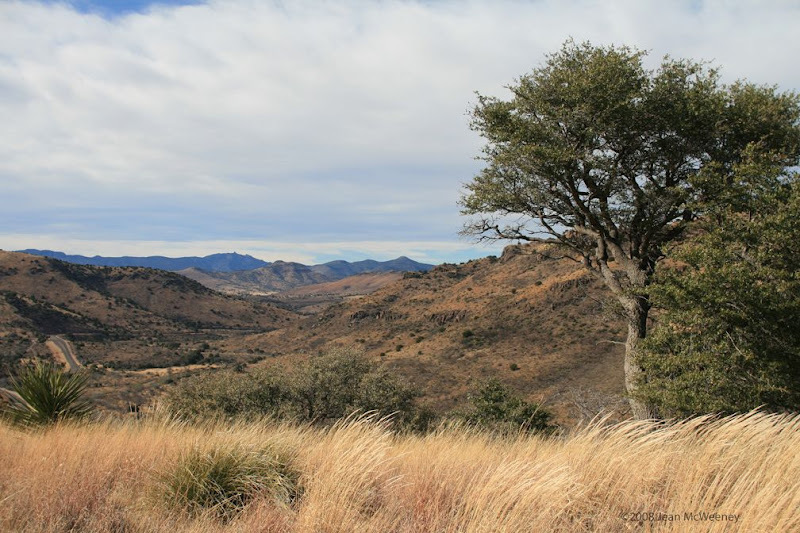 These photos were taken last December in Davis Mountains State Park in far southwest Texas. I blogged about it back then here and here. I'm not sure what variety of grasses all of these are but in that area the most common grasses are species of grama (Bouteloua spp. ), muhly (Muhlenbergia spp. ), and bluestem (Bothriochloa spp.). Most likely the top photo is of muhly grasses (corrections always welcomed!). This is most likely muhly as well. 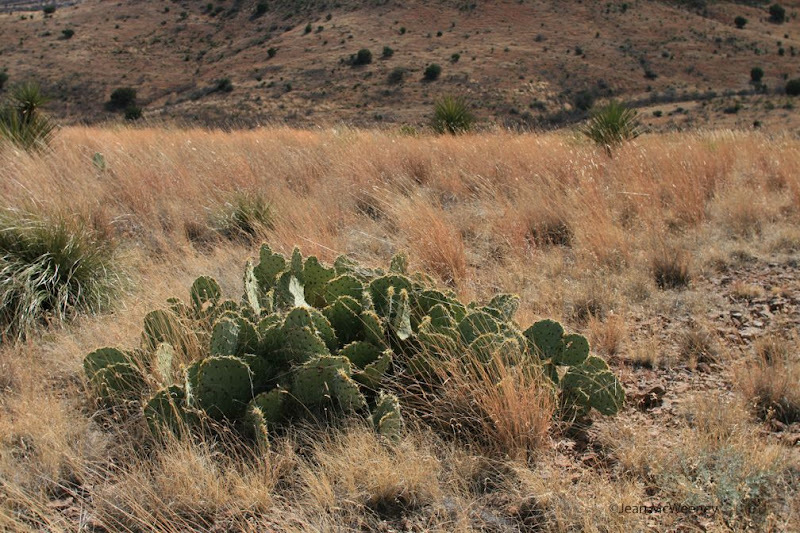 My impression is that all of the plants in this region co-exist in some kind of neat partnership. These grasses look like bluestem. Many different kinds of grasses exist side by side. I just can't get enough of how the grasses contribute to that feeling of movement, peace and serenity. You can see many more lovely photos of grasses in the Comments section of the GGW Picture This post here. I can't wait to see them myself! I love the second photo with the tree on the right but they are all beautiful. I don't think your photo has to be from your own garden. I have a photo I'd like to enter and it was taken in someone else's garden. Hmm, maybe we should ask about that. Actually Phillip, I meant to say that I didn't know if a photo of grasses in the wild would be allowed. Versus "ornamental" grasses in someone's garden, if you know what I mean. Gorgeous photo. I love the contrast between sky and grass with the texture of the trees between. Beautiful pictures as always! I love all the grasses in the wild - we are fortunate to have lots of them around here, but they are just now turning colors. The feather reeds in my gardens have had seed heads for awhile now, but they never look as nice as grasses in the wild. Our Extension Demo Gardens have some beautiful grasses in bloom. I would enter those pictures if I knew it was ok. The grasses make these photos look more like paintings than photos. Just lovely - the color, the motion, the texture! Grasses rock!!!! These are all fantastic photos, Jean! Even if these photos aren't "legal" for the contest, I like this in the wild look. I've seen a few other entries;I'm sure glad I'm not one of the judges--I couldn't begin to choose! I thought I recognized the West Texas landscape. Beautiful pictures, Jean. 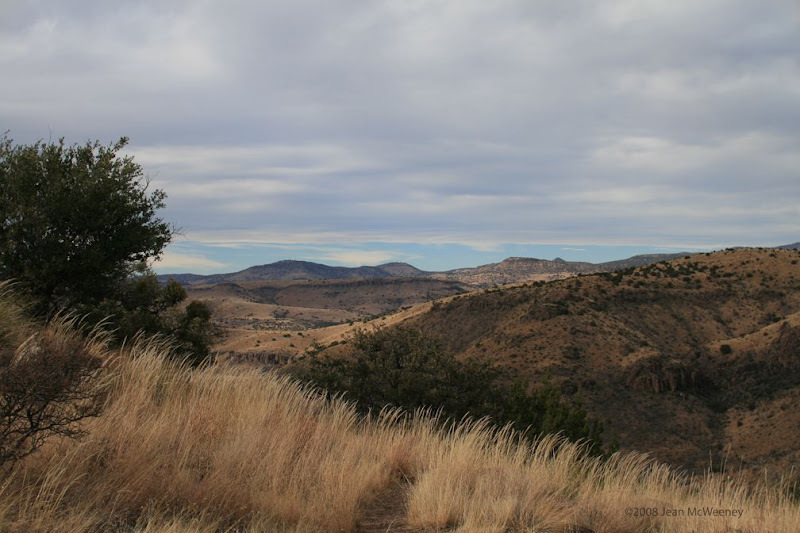 You make me want to go see the Davis Mountains right now. What a view! Gloriously beautiful scenery. If that were my garden, I wouldn't change a thing. Great pictures Jean. I have been eyeing two fields I pass by with an unknown grass, different from most others around here and was always tempted to stop for a photo for the contest in the last month. At the least I should stop with a shovel one day. I agree, I really like the movement of grass, and the subtle colors kind of pick up the natural light and mood of a place. Love the cactus combo, too. They're grasses, they're beautiful, I think it works. I love the juxtaposition of the sky & clouds with the grasses in the first photo. Grasses are wonderful for imparting movement & sound in a garden, or in the wild. Looks great Jean! There are some native grasses in our area turning a pinkish color right now. I love grasses. I had the same thought process and it looks like you and I continue on the same line. I got to looking through the archives and was amazed at how many grass photos I had collected over time. 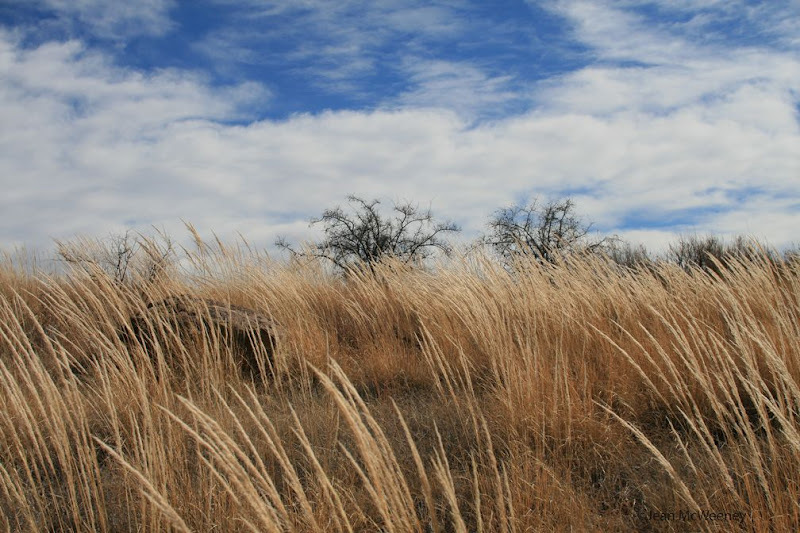 Your photo (entry) is amazing with the blue sky and tan flowing grasses. All the other mountainous photos really drew me in as well. Nice to visit here... it's what I like about these contests... you find new friends. Hi Jean! Thank you for your comment on my blog. It brought me to your place, and I like it here! Yes, the NW has a lot of beautiful places, but look at your pictures! Wonderful! I think a person should just have his/her eyes open to see a beauty around. I love your grass pictures! The first one would be my pick, but the others are great, too! Good luck! 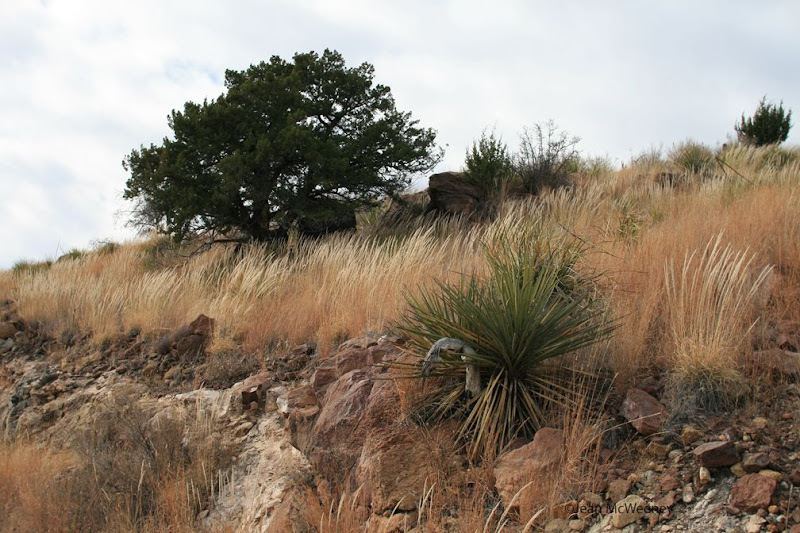 Beautiful photos -- my first thought was, "Wow, Texas really does have such rugged beauty." How funny that I went to a Louisiana blog to see such gorgeous images of Texas! The top photo has me mesmerized. You want to stroke that grass. Such a lovely contrast with the mountains in the distance. Wow...that first photo is a knock out! I hope it is legal for the contest, because it sure is a beauty! They all are. I don't have any ornamental grasses, but I often wonder why not. I'm sure there would be a place for at least 1! Most need sun, though (I think?) and I don't have any place in mind where I could put one. Anyway, good luck w/the contest! Thank you for the sensible critique on www.diggrowcompostblog.com . Me & my neighbor were just preparing to do some research about this. We got a grab a book from our local library but I think I learned more from this post. I am very glad to see such great information being shared freely out there.